The day we’ve all been starving for has arrived! We’ve prepared in our usual fashion by fasting and doing 10 minutes of extra cardio a day. In typical Thanksgiving style we sleep till 11am turn on the Macy’s Day parade and get cooking in the kitchen. We’ve prepped our pies and some of our sides, the turkey’s in the oven and one is fried. Cooking- a nibble here, a sip there and by the time the table’s set to give thanks, we’re already there! Does this sound familiar? We all know it all too well. Giving yourself permission to indulge on holidays is OK but, where do we draw the line? Does your one indulgent meal melt into a 4 day food-cation? Here are some tips to keep you on track as you give thanks and after can give thanks that you won’t need to put in extra hours at the gym. • Pre-Thanksgiving Meal- Turkey day has arrived and you’re going to save all your calories for the big meal. Don’t! Having a protein filled breakfast with 2 eggs, some whole grain toast and avocado (good fat) will sustain you to not over eat when the big meal arrives. A balanced Pre-Thanksgiving meal will keep you from snacking while cooking too. 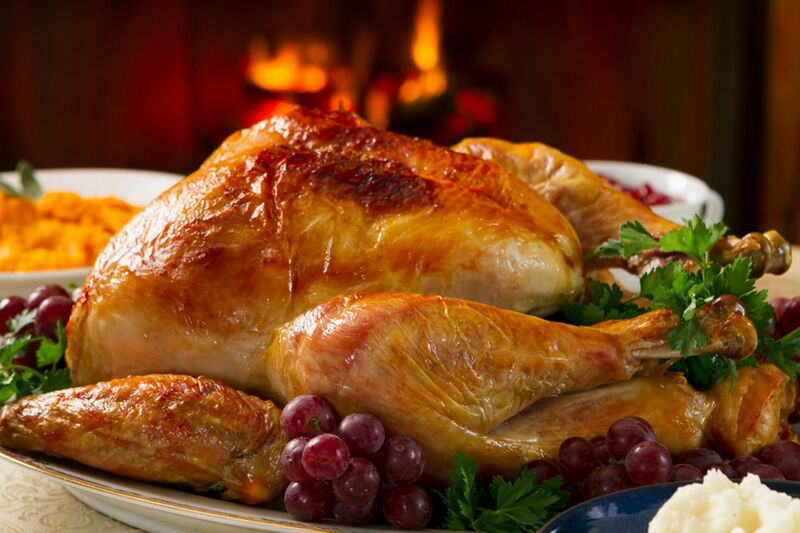 • Let’s Talk Turkey- While deep frying may be the greatest latest craze, as apparently you can even fry a cookie, slow baking your Turkey is the healthiest option. Save 30% of the calories by choosing white meat without skin over dark meat with skin. The good news is if you’re watching your carb intake, turkey is a carb free option. • Sides, Sides, Sides!- For most of us Thanksgiving Day has little to do with the turkey and more to do with the sides. Love the latest foodie trend in Brussels Sprouts, if you think you don’t like them try this recipe for Roasted Parmesan Brussels Sprouts and we’ll surely change your mind. Pop them in the oven after your turkey for a quick treat! • Choose Your Plate Wisely- If there are salad or dessert plates available use these instead of the dinner plate. Think of your plate as the new food pyramid 30% protein 60% vegetable 10% fat and carbs. Yes, do indulge in your favorite green bean casserole and mashed potatoes but these should represent about 10% of your overall plate. • The Holiday of Second Servings- We know, we know, we know, you tried everything once and everyone’s commenting on how delicious the pecan sweet potatoes with brown sugar and extra butter were. Hold your horses, breath after your first plate, sip your wine and take in the moment. You are with your family and give thanks. Make sure 20 minutes have passed so your brain realizes how full you truly are and then you can pass or wait until the dessert course. • Let’s Get This Holiday Started, Pass the Wine!- Yes, free flowing celebrations and our favorite part is the wine. Choose a heavy Cabernet that pairs well with your smoky sides and turkey. If it’s a highly rated wine, you’ll find you drink less of it as you enjoy your company and savor the taste. Swap out for water in-between glasses to keep your digestion flowing and stay hydrated. • Desserts!! !- Did you know it’s stressed spelled backwards? I think for all the extra stress sugar puts on your body. Yes, have a small sliver of your favorite and leave it at that. No, you don’t need it a la mode! • Leftovers, Yes You Must- Because if you don’t get the fridge cleaned out than you’ll go mad. Throw out all carb sides. YES, just do it in the words of Nike. Old mashed potatoes aren’t that good and give the desserts to the kids to take back to school. The next day forgo your usual sandwich and enjoy your guilt free lean white turkey on a salad with some delicious Brussels Sprouts (if there any left, we doubt it). • Now the Party’s Over- Cleaning up the kitchen is a great calorie burner over a 100 calories in a half hour. To end your beautiful day take a walk in nature. Bonus points if you bring your pup or your main squeeze. Prep yourself mentally for these easy swaps and have a guilt free Monday after your holiday! Wishing you many things to be grateful for and healthy thanksgiving. ~ Stephanie Rest is an accomplished Spa Director, and Founder of Caribbean WE. Stephanie Rest is an accomplished Spa Director, and Co-Founder of the Caribbean Spa Association.